In recent years, the West Coast’s booming cities have seen significant population growth, resulting in an ongoing and worsening housing-affordability crisis. Though there are many overlapping causes for this crisis, the phenomenon is partially a product of too much success and not enough planning—cities like Seattle, San Francisco, and Los Angeles have added tens of thousands of new jobs over the years, but have built comparatively few homes to serve those workers. The result is a dizzying increase in the number of people experiencing burdensome rents and homelessness coupled with an expanded reliance on automobile transit as people are forced to live farther away from their jobs in order to afford housing. This regime is straining urban and civic life as more and more people—including college students, school teachers, and even police officers and firefighters— face increasing difficulties in terms of housing affordability. But just as the overlapping crises of climate change, housing unaffordability, and gridlock threaten to overwhelm these cities, potential solutions may be afoot. Across the region, major cities are beginning to cooperate at the regional level with peripheral municipalities in an effort to rein in carbon emissions, increase affordability and equity, and decrease automobile reliance. By relying on envisioned networks of transit-connected villages to grow up rather than out, entire metropolitan regions have the potential to be remade in the image of multi-nodal urbanism. 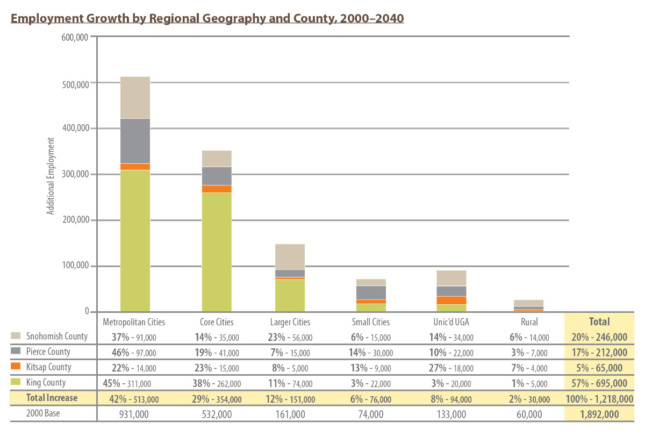 In the Los Angeles area, the Southern California Association of Governments represents 18 million residents across a six-county region with the aim of helping to reduce sprawl. To the north, the San Francisco Bay Area Planning and Urban Research Association aims to unite the region’s 101 municipalities toward measured growth. Of the three major West Coast cities, however, Seattle—nearly 30 years into its own regional planning experiment following the passage of the Washington State Growth Management Act in 1990—is the furthest along in its efforts to articulate a new form of dense regional urbanism centered on regional transit and dispersed density. As it should, the path toward this brave new world begins with high-capacity transit. 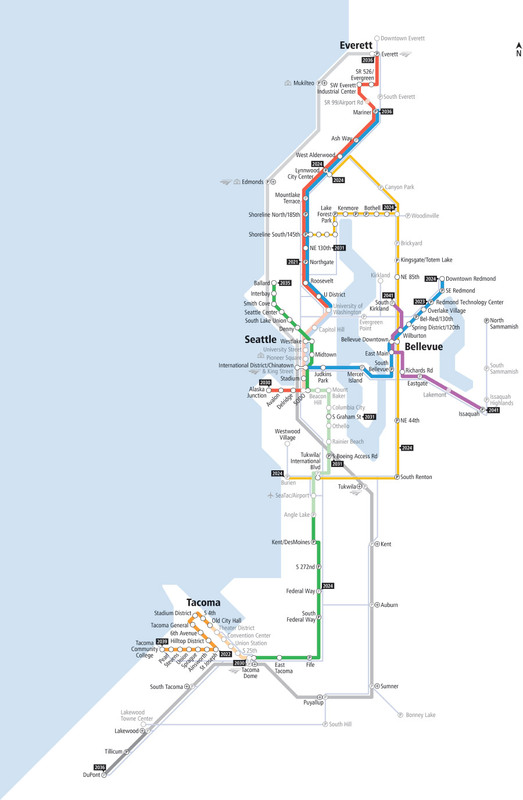 Though only established in 1993, the Central Puget Sound Regional Transit Authority (Sound Transit) is in the midst of a massive, multibillion-dollar expansion plan that will see the transit agency extend a slew of new light rail and bus rapid transit (BRT) lines across the Puget Sound region. 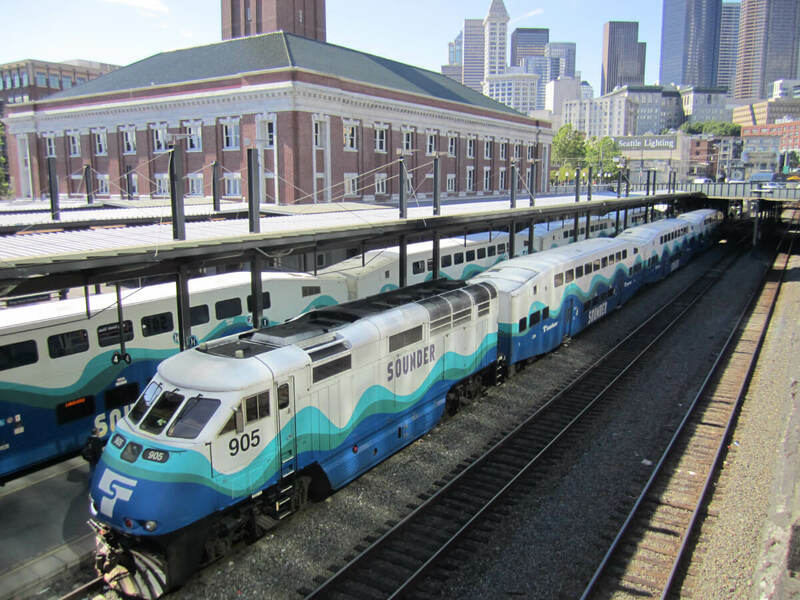 Sound Transit has been undergoing vigorous growth since 1996, when the agency published its initial “Sound Move” plan, which has been amended, expanded, and reapproved by regional voters first in 2008 and again in 2016. The most recent version— Sound Transit 3 (ST3)—consists of a 25-year vision aimed at adding an additional 62 new miles of light rail throughout the region with the goal of ultimately creating 116 miles of light rail augmented by expanded commuter rail and new BRT services. Crucially, the expanded system includes increased street bus service, shorter headways between buses and trains, and increased transit capacity via longer train cars and articulated buses. When fully built out, the system will span north to Everett, south to Tacoma, east to Redmond and west to Ballard and serve a projected population of five million. Aside from being a transit plan, ST3 is also part of a dogged, municipally led vision aimed at supplementing Seattle’s downtown core by investing in and redeveloping existing cities and towns across the Puget Sound. 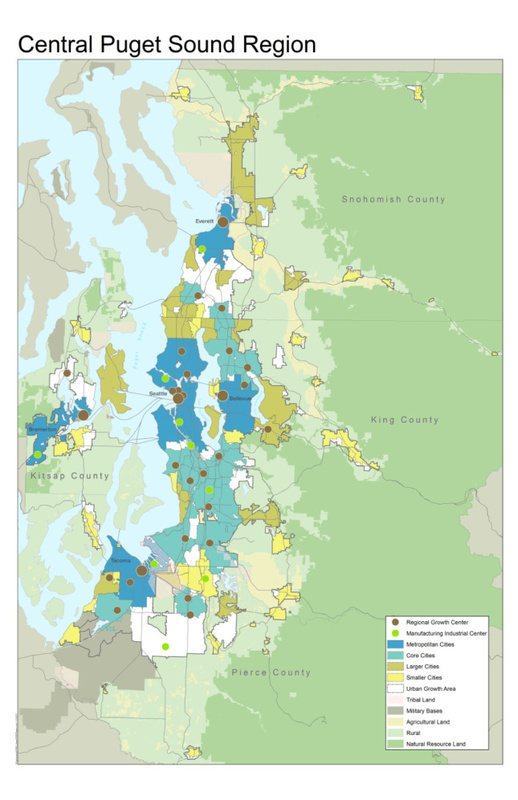 The Puget Sound Regional Council (PSRC), a cooperative agency tasked with envisioning equitable growth strategies for the region, leads the effort on the planning side. The organization helps to study and deploy land-use reforms like up-zoning, works to preserve the location and size of existing industrial lands, and pursues transportation and urbanization planning initiatives with the aim of keeping the rural areas, farmland, and forests around metropolitan regions “healthy and thriving,” according to the organization’s website. The council’s Vision 2040 plan—a growth management– focused environmental, economic, and transportation vision for Puget Sound crafted in 2007—aims to provide a blueprint for this transformation. PSRC’s vision seeks to direct urban growth so that it coincides with Sound Transit’s projected transit map for the future, overlaying progressive planning principles atop new transit corridors before the new lines are ever built. The effect is that land can be bought sooner and at cheaper prices, allowing, for example, nonprofit housing providers to maximize their investments long before surrounding real estate appreciates. Vision 2040 aims to create a set of interconnected “regional centers” that concentrate a density of housing, jobs, and civic and entertainment uses along these new transit corridors. According to PSRC, Washington state’s job growth will be three times higher than the national average over the next five years, a phenomenon the group hopes will reshape the Puget Sound region as a whole. The council is currently working to update its regional-centers plan, and it seeks to cluster groups of complementary industries across the region synergistically with housing and other services. Producing this “housing-jobs balance,” Josh Brown, executive director of PSRC said, is a central mission of the organization. Brown explained, “Our plan calls for larger existing cities to accommodate growth so we can achieve a better housing-jobs balance across the region.” Using this so-called Centers Framework, the organization has been able to create a plan for concentrating urban growth in existing urban centers and projects that, by 2040, the region will be served by over one hundred high-capacity transit stations surrounded by a density of mixed uses. 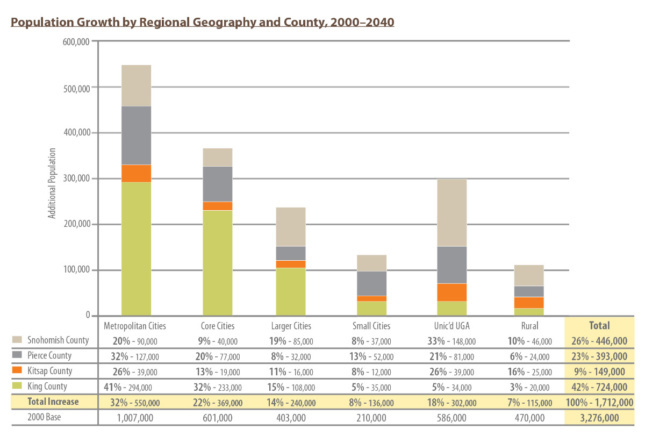 PSRC administers and supports various programs to fulfill these goals, including helping to launch the so-called Regional Equitable Development Initiative (REDI) Fund, which helps to capture low land prices in future-growth areas with the intention of developing mixed-use projects that contain full-throated affordable housing components. The REDI Fund was launched by Enterprise Community Partners and regional partners like PSRC in December 2016 and recently closed on its first deal, a project developed with the Tacoma Housing Authority to create 300 to 500 new homes in the city’s West End neighborhood. For the project, at least 150 of the units will be priced for low- and moderate-income households in a bid to provide affordable housing for community college students in danger of falling into homelessness. The project is planned for a site across the street from Tacoma Community College and will eventually sit at the southern terminus of a forthcoming light rail line. The development will help PSRC achieve its interlocking goals of promoting density in existing corridors while also supporting the region’s burgeoning cohort of future workers. The initiative comes as the region begins to embrace the coming changes. In the city of Lynwood, north of Seattle, for example, a 250-acre site surrounding a forthcoming light rail station is being redeveloped into a district called City Center that will contain mixed-use development and include a convention center and pedestrian- oriented street design. The plan will help Lynnwood grow in population by over 50 percent in coming decades. The eastern city of Redmond—where Microsoft’s headquarters are located—is also pushing forward on new transit-oriented projects, including the city’s Overlake Village, a 170-acre district that will contain 40,000 residents in the future. The first phase of the redevelopment is a 1,400-unit complex called Esterra Park that will also contain 1.2 million square feet of offices, 25,000 square feet of retail uses, a hotel, and a conference center. Taken together, the multifaceted growth plans in place across the Puget Sound region can serve as an example of a potential future for West Coast cities, a vision that is particularly focused on equity, pedestrianism, and dense urban redevelopment.